In a group of older adults with very mild dementia, we aimed to characterize the nature and magnitude of cognitive decline as measured by the Cogstate Brief Battery, in relation to Aβ levels and hippocampal volume. Participants were characterized according to their status on the Clinical Dementia Rating (CDR) scale. A total of 308 individuals who were CDR 0 and had low cerebral Aβ levels (Aβ−), 32 individuals who were Aβ− and CDR 0.5, and 43 individuals who were Aβ+ and CDR 0.5 were included in this study. Participants completed the CogState brief battery at baseline, and at 18-, 36-, 54- and 72-month follow-up. Linear mixed model analyses indicated that relative to the Aβ− CDR 0 group, the Aβ+ CDR 0.5 group showed increased rates of memory decline and hippocampal volume loss. However, compared to the Aβ− CDR 0 group, the Aβ− CDR 0.5 group showed no changes in cognitive function or hippocampal volume over 72 months. 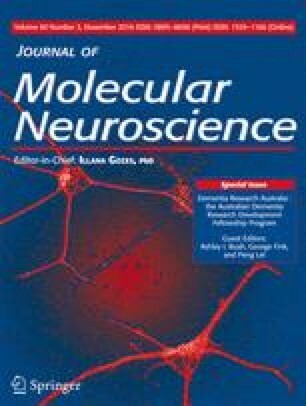 The results of this study confirm that in individuals with very mild dementia, who also have biomarker confirmation of Aβ+, changes in cognitive function manifest primarily as deterioration in memory processing, and this is associated with hippocampal volume loss. Conversely, the absence of any cognitive decline or loss in hippocampal volume in individuals with very mild dementia but who are Aβ− suggests that some other non-AD disease process may underlie any static impairment in cognitive function. Alzheimer’s Australia (Victoria and Western Australia) assisted with promotion of the study and the screening of telephone calls from volunteers. The AIBL team wishes to thank the clinicians who referred patients with MCI or AD to the study: Associate Professor Brian Chambers, Professor Edmond Chiu, Dr. Roger Clarnette, Associate Professor David Darby, Dr. Mary Davison, Dr. John Drago, Dr. Peter Drysdale, Dr. Jacqueline Gilbert, Dr. Kwang Lim, Professor Nicola Lautenschlager, Dr. Dina LoGiudice, Dr. Peter McCardle, Dr. Steve McFarlane, Dr. Alastair Mander, Dr. John Merory, Professor Daniel O’Connor, Dr. Ron Scholes, Dr. Mathew Samuel, Dr. Darshan Trivedi and Associate Professor Michael Woodward. We thank all those who participated in the study for their commitment and dedication to helping advance research into the early detection and causation of AD. Funding for the study was provided in part by the study partners [Commonwealth Scientific Industrial and research Organization (CSIRO), Edith Cowan University (ECU), Mental Health Research institute (MHRI), National Ageing Research Institute (NARI) and Austin Health, CogState Ltd.]. The study also received support from the National Health and Medical Research Council (NHMRC) and the Dementia Collaborative Research Centres program (DCRC2), as well as funding from the Science and Industry Endowment Fund (SIEF) and the Cooperative Research Centre (CRC) for Mental Health, an Australian Government Initiative. YYL is currently funded by the National Health & Medical Research Council-Australian Research Council (NHMRC-ARC) Dementia Research Development Fellowship (APP1111603). YYL, SML, CF, SRS and OS report no disclosures. CLM is an advisor to Prana Biotechnology Ltd. and a consultant to Eli Lilly. PM is a full-time employee of Cogstate Ltd. RHP and PJS are scientific consultants to Cogstate Ltd. DA has served on scientific advisory boards for Novartis, Eli Lilly, Janssen and Pfizer Inc. RNM is a consultant to Alzhyme. C.C.R. has served on scientific advisory boards for Bayer Pharma, Elan Corporation, GE Healthcare and AstraZeneca; has received speaker honoraria from Bayer Pharma and GE Healthcare and has received research support from Bayer Pharma, GE Healthcare, Piramal Lifesciences and Avid Radiopharmaceuticals. VLV served as a consultant for Bayer Pharma and received research support from a NEDO grant from Japan.